UPDATE: Due to timing issues, this dinner has been canceled. In my few trips to The Magpie, I have become very impressed with Chef Owen Lane’s food. I’m really intrigued by this beer dinner menu he has put together with Hardywood on Tuesday April 9th at 6pm. I’ve been afraid of trying sweetbreads before but the General Tso’s preparation should add a familiarity for the uninitiated. Oh and a Hardywood tripel? Yes, please! The cost for the dinner is $70/person plus tax and gratuity. 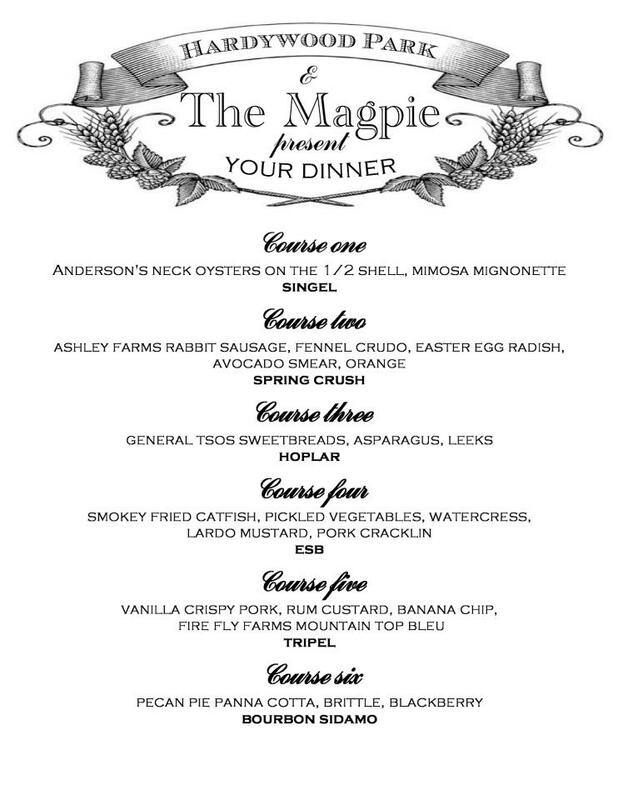 Call The Magpie at (804) 269-0023 to make your reservations now.